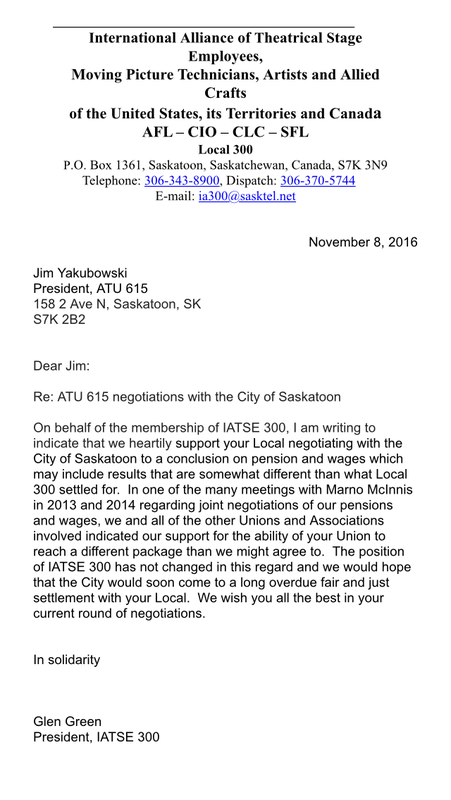 As Saskatonians prepare to make a big decision about our collective futures, ATU 615 urges the public to stand for the virtues that have been sorely lacking in City Hall for the past thirteen years. Fairness, transparency, and facts are the things this community values, but Mayor Don Atchison and his supporters, like the North Saskatoon Business Association, have refused to consider. Attached to this statement is a copy of an analysis of the General Superannuation Plan for the City Of Saskatoon employees. ATU 615 members sanctioned our union to seek from a certified outside actuarial firm an analysis with respect to the funded status of our plan. Ironically, on September 22,2014— two days into the illegal lockout — I addressed city council at the special meeting during which council imposed changes to our pension without negotiating an agreement. I put forth a proposal that council halt the lockout and seek an outside actuarial opinion. They refused to do so. Thus, in September of 2016, we were provided this document. There is no disputing the accuracy of the numbers therein, as Optimum simply utilized previous pension valuations filed as well the audited financial statements prepared by Deloitte Touche. Fast forward nine months later. In September of 2014, ATU members were illegally locked out, and the city claimed they had a huge 6.9 million liability payment of $90,000 per month because of its failure to reach an agreement. Legally, they were required to make at least one payment, but they simply could have eliminated any need for further payments by filing a new valuation reflecting the true financial picture of the plan as of September, 2014. Instead, council chose to force economic hardship on our members, bus riders, citizens and businesses, all in an effort to force our members into relinquishing our defined benefit security, even though they knew our plan was financially healthier than what was relayed at the bargaining table. NSBA, in its recent statement, says, “Clearly nowhere in the big picture is there room for defined benefit plans.” This is only true if you are looking at the big picture through an ideological fog. Since 1964, civic employees (except police, fire) have been negotiating this plan to ensure its sustainability and overall financial health. We have deferred our wages into this plan on the basis we can retire with dignity and security. Our members have also joined the Canadian Labour Congress in fighting for improvements to the Canada Pension Plan (coincidentally, one of the most successful defined benefit plans in the world) so that all citizens of Canada can retire without living below the poverty line. Here in Saskatchewan, the city of Regina, which has an indisputable 200 million dollar deficit in their plan, still provides a defined benefit for members, because the parties successfully negotiated terms and conditions protecting the security. Mayor Don Atchison is on public record (Global TV) stating “your word is your bond” in reference to me after the illegal lockout. This is one statement that I can agree with Don Atchison. You have my word that these are the facts and truths surrounding our fight for fairness. I have been raised to always speak the truth and believe the truth will prevail. The citizens of Saskatoon have been misled and used as pawns by our current decision makers, and their tax dollars have been wasted by these actions. If truth, transparency and fairness are leadership qualities you desire, then we must cast our ballots on Wednesday for a new direction. No matter the outcome, ATU 615 will continue to fight for fairness, transparency, and facts on all issues affecting our members and our riders. The North Saskatoon Business Association has sent a clear message to all citizens on behalf of all their association members. The comments contained in their recent release, entitled, “ATU support sends wrong message,” are disturbing for a number of reasons. For an entity that represents businesses to challenge our endorsement of Kelley Moore and proceed to support the current position of the city clearly aligns the NSBA with Mayor Don Atchison and his administration. This same civic leadership is responsible for illegally locking out our membership, depriving the citizens of their transit service, and, ironically, negatively impacting many businesses that the NSBA represents. Isn’t it ironic that our taxpayer dollars are used to buy a membership in the NSBA? Saskatoon City Manager Murray Totland, who initiated the illegal lockout of our members, is a member of NSBA and also sits as a trustee of our pension plan. Attempts have been made by Totland and Atchison years ago to convert this defined benefit plan to something different. Isn’t it ironic that these same individuals, now as Mayor and City Manager, are attempting the very same thing once again, when clearly the pension plan financial status today does not indicate that any radical change, such as converting the risk onto the shoulders of plan members, is necessary? Isn’t it ironic that the NSBA is not demanding that our provincial politicians give up their own rich defined benefit plans, but rather choose to attack blue collar working people’s retirement? “ATU 615 expresses concern that Don Atchison and the majority of Council support taking supervisory positions out of all of our civic unions, even though these positions have been a part of our respective collective bargaining agreements for many years, without issue. The city administration has made it clear that they want to water down strong collective bargaining agreement language on promotion seniority clauses. If our respective locals do not agree to accepting the city’s proposed language, the administration will identify and initiate attempts to have many positions taken out of our locals. Reconvening bargaining on October 11th and there will be no job action prior to our next bargaining session.